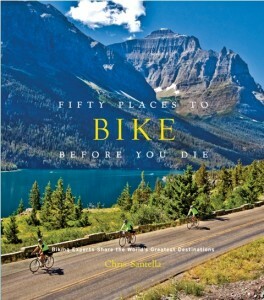 I’m happy to announce that my 11th book — Fifty Places To Bike Before You Die — has recently been released by Stewart, Tabori & Chang. After appearing on an Oregon morning television program today (AM Northwest), I realized it would be wise to post something about this monumental event. The publisher’s press release is below. As always, the destinations are brought to life with breathtaking color photographs and are accompanied by fascinating essays. In addition to his own writing, Santella features commentary by top names in the field, including author Joe Kurmaskie (aka “The Metal Cowboy”), and editor Andrew Bernstein of Bicycling magazine. Fifty Places to Bike Before You Die is a highly giftable book, perfect for anyone looking to have a unique biking adventure.